Boudin’s art is the kind of art which wins you over, not by its audacity of expression or the obtrusive violence of its touch, but by its beauty, which combines intimacy, delicacy and truth innovative in a way because it developed towards the open air, toward impression…his palette of greys and blues, his exquisite shading, his consistent harmony were neither conventional nor formulistic – rather, they were an accurate reflection of nature glimpsed sensitively. Despite his influence on younger artists, Boudin was a modest and indefatigable worker who was never satisfied with his perceived inability to fully render the splendors that nature set before him. Throughout his career, he struggled to overcome his own melancholic disposition and self-deprecation, despite continual praise from his many acquaintances, of which one could count Constant Troyon, Jean-Francois Millet, Gustave Courbet, Monet, and Charles Baudelaire, to name just a few. Jean-Baptiste-Camille Corot even referred to Boudin as “the king of skies.” Given his personality, Boudin most likely never fully grasped the significance of his artistic contribution: that he was the, according to art critic Arsène Alexandre, “precursor” to the Impressionist movement, a stepping stone to one of the most talked about and, in modern times, one of the most popular phases in nineteenth century art. Boudin’s ability to “conserve an attitude of familiarity with nature…without seeking to flatter or embellish it,” gave his audiences the opportunity to be “put in direct contact with her,” (Claude Roger-Marx, Eugène Boudin: 1824-1898, Paris: Les Editions G. Crès & Cie, 1927, pg. 41) a feature that was often lost on the later generations of painters. Eugène Boudin was born in July 12th, 1824 in Honfleur, in the Normandy region of France. He was born into a family whose life revolved around the sea: both his mother and father made their living in the maritime community, his father eventually becoming a captain and his mother working as a stewardess. Eugène began working alongside his father around the age of ten, when he became a cabin boy on his father’s boat, the Polichinelle, which navigated between Honfleur and Rouen. Aboard the Polichinelle, Eugène began his first drawings, sketching in the margins of his book. While this experience was undoubtedly important for Eugène’s interest in the sea, he did not stay long aboard the Polichinelle after almost drowning and given the Polichinelle’s unreliable history of capsizing. 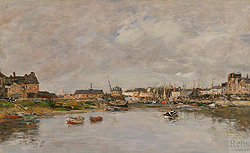 The family relocated to Le Havre in 1835 where Boudin enrolled in the École des Frères on the rue St. Jacques. He remained here for just one year, where he won an award for handwriting and where he was known to draw birds and leaves on his school notebooks. At the end of the school year, a young Boudin began working for the printer Joseph Morlent before moving shortly thereafter to work with Alphonse Lemasle in his stationery shop on the rue des Drapiers. Lemasle appreciated Boudin’s diligent nature and took notice of his interest in drawing. He purchased for him his first set of paints. Boudin remained with Lemasle until the age of eighteen, at which point he left to establish his own business alongside Lemasle’s foreman, Jean Acher. Boudin and Acher opened their stationery shop in 1844. A thriving enterprise, it became a center for local artists, selling not only supplies, but also providing a space in which to show their pieces. It became somewhat of a gallery for local artists and gave Boudin important exposure to a way of life that he had not yet entirely discovered – that of the artist. It was exactly this penniless existence that Jean-Francois Millet cautioned Boudin against engaging in, warning him of the difficulty of such a lifestyle. Boudin did not heed Millet’s advice, however, since his encounters with other artists such as Constant Troyon, Thomas Couture, and Eugène Isabey encouraged him to pursue his own artistic explorations. While the business he and Archer had organized had been successful in bringing Boudin into contact with a number of very influential artists, he eventually sold his share of the business in order to pay another man to take his place for his obligatory military duty. It was at this moment that Boudin focused his attention solely on beginning his career as an artist. As with any artist embarking on their artistic career, he faced extreme difficulty in the beginning years, working tirelessly from dawn to dusk along the seaside, sketching everything that he saw. He experimented with as many different media as he could afford – pastels, watercolors, paintings, drawings, and sold flower paintings and still-lifes on the side to make ends meet and in order to save enough money to travel to Paris. He eventually left for Paris in 1847. What he did not know at this point was that it would be his point of origin, the beaches of Normandy, to which he would continually return. 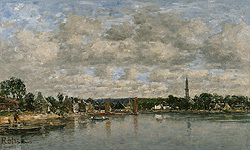 Boudin left for Paris with many contacts, but he remained a solitary figure, spending the majority of his free time studying the old masters of the collection at the Louvre. In 1849 he was recruited to assist the sculptor Louis Rochet on a journey to raise lottery funds that would benefit artists. It was a fortuitous occasion for him, since he was able to go to the museums in Belgium and study painters from the Dutch school, notably Willem Van De Velde, Jacob van Ruysdael, and Paulus Potter. Combined with his previous study at the Louvre and his experiences traveling throughout the regions of northern France and into modern day Benelux, Boudin had been exposed to both the modern and past traditions even though he never had the luxury of artistic training that so determined the course that many of his contemporaries eventually followed. 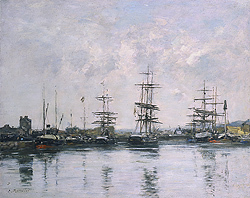 Boudin arrived in Paris in 1851, but to the dismay of the original committee members who awarded him the grant, he spent the majority of his time outside of Paris, traveling between Rouen, Le Havre, Honfleur, and Caen, escaping from the confines of the city to commune with the natural landscape. Paris was not suitable for his interest in plein air painting and it offered Boudin little by way of artistic freedom, for he wrote that, “In Paris I am like an exile.” (Jean-Aubry & Schmit, pg. 127) The idea of composing a painting solely within the studio did not appeal to Boudin. Boudin firmly believed that “Everything that is painted directly and on the spot always has strength, a power, and a vivacity of touch which one cannot recover in the studio.” (Vivien Hamilton, Boudin at Trouville, ex. cat., London: John Murray Ltd, 1992, pg. 16) For Boudin, “Three strokes of the brush in front of nature are worth more than two days of work at the easel (in the studio).” (Hamilton, Boudin at Trouville, pg. 16) But Boudin’s method, while en plein air, was nevertheless meticulous in its arrangement. He would execute a vast amount of sketches before composing the final canvas. Nature is so beautiful that when I’m not tortured by poverty I’m tortured by her splendour. How fortunate we are to be able to see and admire the glories of the sky and earth; if only I could be content just to admire them! But there is always the torment of struggling to reproduce them, the impossibility of creating anything within the narrow limits of painting. ...they would then understand what they do not seem to understand, namely the difference between a sketch and a picture…He well knows that all this must be made into a picture by applying poetic impression recalled at will: he is not pretentious enough to claim that his sketches are finished pictures. Even Boudin’s finished pieces, however, show the beginning of a freeness in overall execution bordering on a sketch-like rendering. Boudin’s search for the ideal setting for his sketches had taken him through Normandy and in 1855, through the region of Brittany and to the cities of Douarnenez, the city of which he had “been dreaming of,” (quoted in Jean-Aubry & Schmit, pg. 23) and Quimper. Far from representing the pursuit of a single artistic goal, his art and career, particularly during the 1860s, embodied many of the key dilemmas facing painters in those years. In terms of technique, he pursued a shorthand method of transcribing his perceptions of the most fleeting natural effect, and yet he believed that true art was the product of the creative imagination; in his subject matter, he was torn between a fascination with he world of high fashion, on parade on his beloved Normandy beaches, and a feeling for the indigenous customs of rural communities; and in seeking markets for his work, he exhibited at the Salon but also exploited all other possible means of putting his paintings before potential buyers. Where many painters only found a pretext for larges surfaces of blue, opaque and dirty, Eugène Boudin astonishes us by a variety and an incomparable accuracy: for him each cloud has a physiognomy... to give us the impression of immensity and to hold our attention, allured by the innovation of a spectacle which everyday we have under our eyes and which we had never seen. Boudin’s images found a pocket of popularity with those frequenting the beaches in Normandy. But it was not enough to provide him with a comfortable living and Boudin began looking for other means by which to profit from his work. Though not immediately successful, he eventually negotiated enough contacts for his work to be shown semi-regularly at a number of different dealers. 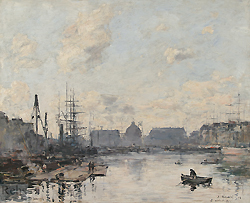 Throughout his career he would try other avenues, as well, such as staging his own auctions – Le Havre (1857, 1879), Caen (1862), and Paris (1879, 1888). 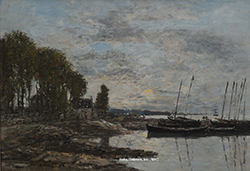 Overall, these auctions were of limited success and it was not until the 1880s when Boudin secured a permanent relationship with Paul Durand-Ruel that Boudin had a consistent sponsor for his work. Even though Boudin was continually submitting to both the Parisian salons and many other provincial Salons, he had yet to receive the public and private presence for which he had hoped. It was not until around 1869 that his name began to be recognized on a more regularized basis. He had continued exhibiting at the Parisian Salon since his debut in 1859 and had also begun working with exhibitions in the cities of Rouen, Pau, Roubaix and Grenoble. In 1870 he was sought out by a Belgian dealer, M. Gauchez, who commissioned several works from him and invited him to Brussels at the outbreak of the Franco-Prussian war in 1870. Boudin remained here until August, 1871. Despite having several misgivings about the atmosphere and general environment in Brussels, he returned to Belgium in 1875 and 1876. In 1874, a controversial exhibition at the photographer Nadar’s gallery took place, featuring a number of artists with audacious styles, such as Paul Cezanne, Edgar Degas, Monet, Camille Pissaro, Pierre-Auguste Renoir, among other avant-garde artists. It was the first Impressionist exhibition and Boudin, too, was an exhibitor. 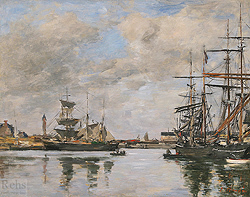 He submitted two canvases and several pastels and watercolors, while simultaneously exhibiting at the Parisian Salon (Quai du Portrieux (Riverbanks of Portrieux) and Rivage du Portrieux (Shore of Portrieux), showing Boudin’s diverse acceptance – being simultaneously present at the avant-garde exhibition at Nadar’s and the Salon, the latter being considered somewhat of an enemy of the former. This was the only Impressionists exhibition in which Boudin participated, but it was an important moment, showing the links between the past and future tendencies of French artists, Boudin acting as an important link between the two. This artist’s impulsive intelligence and initiative has never, since he began to exhibit, won him any recompense: this is a glaring injustice that one must never cease to publicize. They will let this painter grow old, they will let illness weaken him and they will make his decline their pretext for abandoning him to this death, uncaring of his great value. He did, eventually, achieve such recompense, in the form of notoriety, public acceptance and sales, and awards. 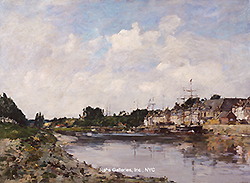 In 1881 Boudin received his first medal from the Salon jury, a third class medal for La Meuse a Rotterdam (The Meuse River at Rotterdam) and in 1883 received a second-class medal for L’Entrée (The Entrance) and La Sortie (The Departure). 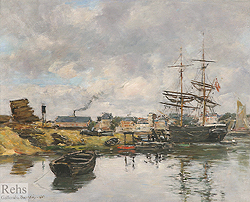 His paintings were also often purchased by the State, such as his 1886 Salon entry Un Grain (A Grain) in 1888, La Corvette Russe Dans le Bassin de L’Eure – Le Havre (Russian Corvette in the Basin of the Eure River – Le Havre), and in 1892, Rade de Villefranche (Villefranche Roadstead), the same year he was named a Chevalier of the Legion of Honor. He continued to submit to the Salon until his death in 1898. 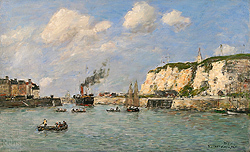 Boudin became frailer and he was encouraged to spend the winter months in the south of France, near the cities of Villefranche, Antibes, and Beaulieu. 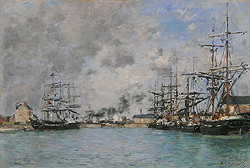 He traveled further east to Venice, as well, and eventually returned to the north of France and painted at Dieppe, Fécamp, Le Havre and into surrounding countries. He had once written in his journal, “I am obsessed with the idea of leaving. I must travel, for that would probably relax me.” (quoted Jean-Aubry & Schmit, pg. 21) His wife had passed away in 1889 and it was in traveling and painting that he found his solace. Sensing an impending death, he returned to Deauville, next to the sea, in 1898, where he died on August 8th of that same year, most like from stomach cancer. In a career that lasted over half a century, Boudin produced over 4,000 paintings and over 7,000 drawings, watercolors, and pastels. (Hamilton, pg. 9) Though his production was fecund, it was not until much later in his life that he began to be more fully recognized for the talents that he had been developing for decades. He remained steadfast in his dedication to the sea and moved from location to location to satisfy his aesthetic desire. His career is important not only for being an influential artist for a younger generation of Impressionists, but for his ability to cross the borders of a over-politicized and bureaucratic artistic system that often stifled many artists’ ability to successfully and easily gain a public presence. His participation in such varied exhibitions – from the large scale of the Parisian Salon to more progressive exhibitions such as the Impressionist exhibition and those of the Société Nationale des Beaux-Arts – gave him an opportunity to be associated with artists and patrons at varying levels and interests. 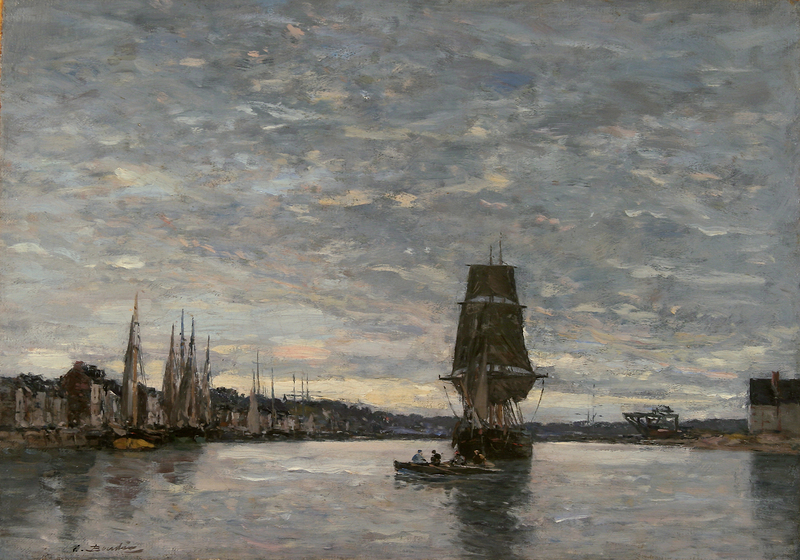 By the end of his career, Boudin was regarded as the premier marine painter whose popularity continued to grow after his death in 1898. 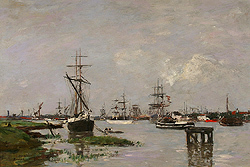 Many of Boudin’s painting can be found in the Musée Eugène Boudin in Honfleur as well as the Musée d’Orsay in Paris. The Louvre also possesses the largest collection of Boudin’s original watercolors, pastels, and drawings. His work is also featured in numerous other provincial museums throughout France, some of which are located in Pau, Lisieux, Dijon, Evreux, Valenciennes, Rennes, Douai, Rouen, Lyon, Bordeaux, Caen, and Lille. His work is also part of several American collections including the Metropolitan Museum of Art.